available exclusively at Russian Treasure store. This set of Matryoshka nesting dolls is specially designed to feature the most influential political figures of the present time (Obama, Bill Clinton, Hillary Clinton, G.W. Bush, G. Senior Bush). The first Matryoshka nesting doll presents the image of the current president Barak Obama. Hillary Clinton is featured on the second Matryoshka nesting doll. 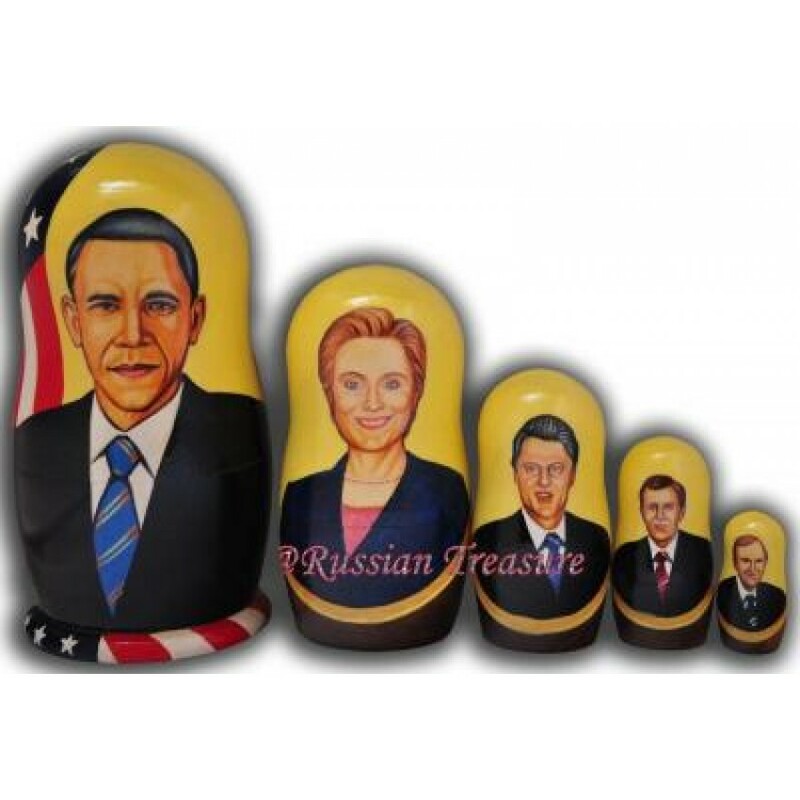 Bill Clinton, the forty second president is portrayed on the third Matryoshka nesting doll. George W. Bush, the forty third president, is featured on the fourth Matryoshka nesting doll. One can also notice a distinct resemblance between him and his father, George H.W. Bush, who is depicted on the smallest Matryoshka nesting doll. This set of Matryoshka nesting dolls will make a perfect souvenir with some humorous political connotation. These Matryoshka nesting dolls are especially noted for their exquisite lacquering technique and an excellent quality that you can feel by simply holding a Matryoshka nesting doll in your hand. Russian Treasure is proud to present this set of Matryoshka nesting dolls to you, as every single piece of artwork is personally selected from the artists that we have worked with for many years.